The 2014 Inky Awards longlist for peer-recommended, high quality young adult fiction has been announced by the Centre for Youth Literature (State Library of Victoria) at the Somerset Celebration of Literature festival in Queensland. The Inky Awards are one of Australia’s most anticipated prizes for young adult literature. Two prizes are awarded: the Gold Inky Award (which includes a $2,000 prize) to the most popular Australian book and the Silver Inky Award for an international book. The 20 books on the longlist will be judged by a panel of six teen readers with top ten books progressing to the popular choice voting round in August. When the shortlist is announced teen readers can vote for their favourite books via the Centre for Youth Literature’s website insideadog.com.au. The Centre for Youth Literature’s Manager, Anna Burkey, says the Inky Awards encourage teens to read for pleasure and share the stories they enjoy. The Inky Awards were founded in 2007 by the Centre for Youth Literature at the State Library of Victoria and are Australia’s first national awards for literature to be voted for teenagers (12 to 20 year olds). The overall winners will be announced at a special Inky Awards event on 21 October. Join the conversation online using #InkyAwards. 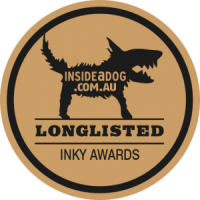 View the 2014 Inky Awards longlist now. insideadog.com.au is Australia’s best-loved website for books and reading for young people. Inside a Dog is a project of the Centre for Youth Literature at the State Library of Victoria.